Back in 1997, the California band called Blue Shift released an excellent album called Not The Future I Ordered. The album made waves in the progressive rock community but following that, not much was heard of the band... until now. 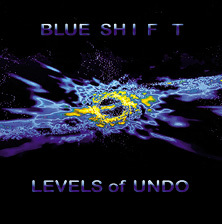 In 2015 Blue Shift returns with Levels Of Undo. The band now features a new singer named Denise Chandler, while the core of the band still includes founding members Joey Backenstoe (guitars), Mark Barton (keyboards) and drummer Steve Sklar. A sonic masterpiece, Levels Of Undo sounds great on CD and veers all over the musical map, taking well into consideration the band's roots in progressive rock, jazz and electronica. The diversity really shines through on a Blue Shift cover of the Rolling Stones 1967 classic 2000 Light Years From Home while I Remember Ted is Backentoes warm-hearted solo jazz guitar instrumental tribute to the late great jazz guitar icon Ted Greene. 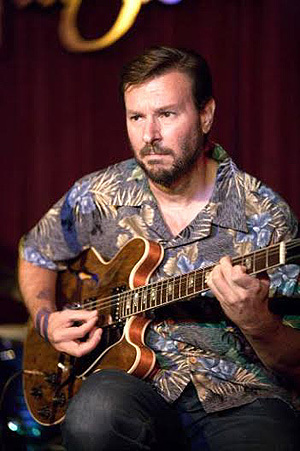 As Levels Of Undo points out, Joey Backenstoe is truly one of the most gifted guitarists on the music scene and as such, hes kind of the American version of Steve Howe. Like Howe, Backenstoe is proficient in both the jazz-rock and prog guitar worlds. 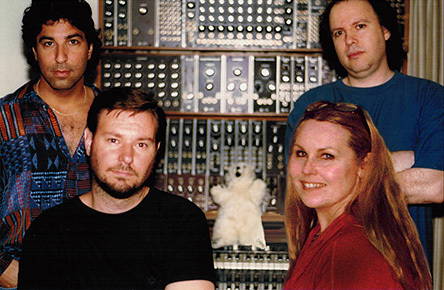 Keyboardist Mark Barton is kind of the American Keith Emerson and like Emerson, Barton is very influenced by both prog-rock and jazz with special leanings towards the world of electronica and especially 20th century innovator Wendy Carlos, who in fact used to be Walter Carlos. Speaking to mwe3.com about the creation of Level Of Undo, Joey Backenstoe explains We would each work on ideas individually, and then come together periodically to present our demos to one another. We would then hash out the details and work on the arrangements together. Steve and Denise had some valuable input when it came to the arrangements, with Mark Barton adding Lets put it this way. L.O.U. is a product of the modern computer age. As much as we love to play together as a band, that wasnt always possible during recording. The computer also allows us to agonize over and discuss every note. We have come to the conclusion that this is actually a good thing. Im sure Beethoven did the same. Whether your tastes lean towards progressive rock, instrumental jazz fusion, mainstream guitar jazz or classic experimental keyboard electronica, Blue Shift covers all the sonic bases in style on their long awaited masterpiece comeback, Levels Of Undo. mwe3: Why the long wait since the 1997 Blue Shift CD, Not The Future I Ordered. The 2015 Blue Shift album Levels Of Undo is well worth the wait but tell us how the band came back again and how the new album came together? Is the new album featuring the original band, although I know you have a different singer now. Joey Backenstoe: Basically, life just got in the way. We all had families and careers which kept us busy, but we were determined to see it thru even if it meant working in a piecemeal manner. Levels Of Undo, except for Denise on vocals, features the original members. Mark Barton: The wait may have had a positive effect. It gave all of us a lot of perspective on how these tunes hold up. Do we still like the songs 3 months later? We took advantage of the gaps. Getting mixes right, especially on music like this, is difficult. I even bought a little FM broadcast transmitter so we could mix a song in the studio and then go out to our cars and listen to it on the radio. mwe3: Where do the other Blue Shift members live and did that impact the way the album was recorded? Tell us something about the way the album was recorded. Joey Backenstoe: Most of us live in the Los Angeles area. Mark and I composed most of the material. We would each work on ideas individually, and then come together periodically to present our demos to one another. We would then hash out the details and work on the arrangements together. Steve and Denise had some valuable input when it came to the arrangements. The title track was a ton of work, and more of a band effort. I pretty much wrote all of the music for Drivetime, and Savant Guard is Mark's tune. Mark Barton: Lets put it this way. L.O.U. is a product of the modern computer age. As much as we love to play together as a band, that wasnt always possible during recording. The computer also allows us to agonize over and discuss every note. We have come to the conclusion that this is actually a good thing. Im sure Beethoven did the same. mwe3: Why do you call the CD Levels Of Undo? Is that because of the undone work of Blue Shift? Mark Barton: I will not keep this mysterious title a mystery any longer. I was reading about some PC application having essentially infinite levels of undo, like you could take back anything youve ever done, and I thought it sounded kind of quantum mechanical. I imagined the levels of undo corresponding to parallel realities, and we could hop from level to level like an electron changes energy states. There, that sounded cosmic enough. mwe3: How does the Levels Of Undo album compare, in your opinion, with your first album Not The Future I Ordered both musically and the way it was recorded. Must be a whole different world. Who was your original singer? Joey Backenstoe: I personally favor Levels Of Undo over Not The Future I Ordered just a bit... I find it more progressive. Not The Future was recorded on magnetic tape. Levels was recorded digitally, so fine editing was easier. The original singer, Stewart Meredith moved to England years ago to pursue other musical interests. On the first album, Stewart's contribution was a bit more pop oriented and accessible, but great songs nonetheless. Mark Barton: Right at the outset, we all decided that this album would be progressive and not at all pop. These days, I would feel funny trying. mwe3: The first track on the new album, Drivetime is very jazzy and almost sounds like the California version of Hatfield & The North (for those prog fans in the know). Is there some social statement in that song and who wrote it? Also tell us about your new singer Denise Chandler. Shes great. Joey Backenstoe: As I indicated earlier, I wrote the music for Drivetime, and yes, it is jazzy in spots. Steve, who is an incredible drummer, gives that track a great rock/jazz fusion feel that I really like. Steves influences are Egg, Holdsworth, Return To Forever, Bill Bruford and the like. Mark's organ solo in Drivetime is my favorite solo that he has ever done, the intensity and energy that he brings to that song is just fantastic. My father was a professional jazz pianist and I was heavily influenced by what he did. He was in the Frankie Carle Band and the Sammy Kaye Band in the 1940s. I learned a lot about music theory from him and Ted Greene. As far as any social statement that might be there, I'll defer to Denise, who wrote the lyrics. I first heard her take a shot at vocals on Drivetime, and I was very impressed. We were also all blown away by her haunting treatment of the ethereal section of the title track. Denise Chandler: Joeys music gave me a mental impression of speeding down freeways and through canyons and finally arriving at a calmer place near the ocean. Anyone who is in the L.A. area for any length of time will notice the traffic getting heavier and heavier until it affects life choices. As great as Southern California is, sometimes you want to hop into a great car and escape to someplace else, kind of California transcendental. mwe3: Track 2 on Levels Of Undo, I Remember Ted is a tribute to Ted Greene, the jazz guitar hero. What did Ted mean to you and how did you emulate his guitar sound and vision on what is a most impressive extended guitar solo. Talk about an eclectic shift in sonic perception between Drivetime and track 2! So I Remember Ted is an original? Joey Backenstoe: Ted was a dear friend and one of the most amazing guitarists that I am aware of. I had the pleasure of studying with him for years. He played at my wedding and amazed us all. I tried to somewhat get his sound by using my Tom Anderson Hollow T direct to digital tape. Ted recorded direct to tape with his vintage Fender Telecaster. Yes, there is a huge shift in musical genre from Drivetime to I Remember Ted. Prog fans are very intelligent listeners and I'm hoping that they will be open to that track on the album. Hey, YES fans accepted The Clap and Mood For A Day, so why not? If they can accept ragtime and classical, why not jazz? The intro to I Remember Ted is my composition, however, the other segments are jazz standards - My Romance, I Could Write A Book, and Cheek To Cheek. mwe3: Track 3 Savant Guard is that title a play on words? Another gothic fusion jaunt with definite soundtrack vibes. How do you write a song like that? So many twists and turns and wide ranging dynamics. Is that the Blue Shift trademark sound? Joey Backenstoe: Savant Guard is full of surprises. A friend of mine told me earlier today that he thinks it's the best track on the CD. Mark Barton: Im glad people like it. I didnt want to use any old ideas when writing this song, nothing I had lying around. But I did have the first 4 chords and everything just sort of organically grew from there, sometimes stream of consciousness with no plan. I also knew I wanted a lot of contrast in mood and feel. I think Blue Shift as a band tries to take the listener on little musical adventures. Denise and I co-wrote the lyrics in a 2-hour traffic jam outside of Las Vegas. The Savant Guard are the geniuses that protect us from the truth. Mark Barton: As Denise calls it, Under the Influences, is a tribute to my favorite electronic music artists. Wendy Carlos, is definitely my biggest influence when it comes to synthesizer programming and technique. An electronic sound needs to move and stay sonically interesting, and I learned several techniques for doing that from her. You can hear lots of Emerson influences in my playing too. Im also a huge fan of Louis and Bebe Barrons soundtrack for the 1956 film Forbidden Planet. That, and a little Lost In Space is in there as well. mwe3: Whose idea was it to cover 2000 Light Years From Home? Sounds like Mark is channeling Brian Jones and his mellotron explosions. I always felt the song was underrated. Now you have to get a CD to Mick Jagger. I must say you guys did a totally great job on this! Denise just kills on this track. A first! Joey Backenstoe: It was Mark and Denise's idea. Denise is a huge Rolling Stones fan. I agree that Denise gets a great vibe on this track. On Not The Future I Ordered, we covered Led Zeppelin's Immigrant Song - so why not add a cover tune to Levels Of Undo? Mark Barton: We picked that particular song because we thought it fit in with the mood of the rest of the CD. Its definitely the Stones most psychedelic track. Your mind also needs to be 2000 light years from home to prepare yourself for what comes next. mwe3: The title track Levels Of Undo closes the album. Its pretty remarkable in that its a 20 minute epic track. How did you approach the title track as both a composition and a performance? As great as the other tracks are, the title track is really the high point of the album. Agreed? Joey Backenstoe: The title track is probably the high point. Mark and I spent a huge amount of time writing that one, and I would say that we had equal compositional input. Mark and I grew up admiring the great prog bands of the 70s. We love those band's epic pieces like YES' Close To The Edge, ELP's Karn Evil 9, Genesis' Supper's Ready, etc. We didn't have a piece like that on Not The Future I Ordered, so we wanted to do something on more of an epic scale on Levels Of Undo. Mark Barton: Levels Of Undo was actually called The Epic before any meaning was attached to it. The music came first and when the Levels Of Undo concept kicked in, I was able to write the lyrics for it very quickly. Its the most important piece on the CD and definitely represents the essential Blue Shift. mwe3: Why didnt you print the lyrics with the artwork? Steve Sklar: We truly wanted to focus in on the music. We wanted our fans to open the CD, quickly look for other bits of information; and then say; well, no lyrics, no additional information and get right to the music! This is why we recorded the CD; for our fans to hear our music. Although, I will say, we, as a band, would love to be able to connect with our listeners. Anyone can email us at band@progblueshift.com for the lyrics or f u t u r e communications! mwe3: When did you start working with Musea Records in France, especially as I know you released your first album through Musea too. Wasnt it released privately first? Is it the same Musea from the 1970s? If so, youre in good company. Do you listen to other Musea artists and do you work with Bernard directly? Joey Backenstoe: Not The Future I Ordered was our first interaction with Musea. It was also released privately on Mayday Records (MD2002). The same Musea from the 70s? ... I'm not sure. We have worked with Bernard directly, he's a great guy! I have listened to other Musea artists, there's a lot of great stuff out there. Some years ago, Musea released a CD of cover tunes by Musea artists. It was a very interesting CD and it included our cover of Immigrant Song. mwe3: Can you tell us about the guitars that you play on Levels Of Undo and how has your choice of guitars changed over the years and what are your favorite guitars? Joey Backenstoe: I used a Gibson ES-335, ES-175, Tom Anderson Hollow T, a Rickenbacker 360-12, a Fender Strat, and a Martin 000-28. Over the years, I find myself getting more into hollowbody electrics. They have a certain response that appeals to me. My favorites are my Gibson archtops (ES-335, ES-175, ES-5 Switchmaster, L-5), my Tom Andersons, and recently I have picked up a couple of Collings electrics which are incredible. mwe3: I guess youre busy doing other things. What else do you do to compliment your music? I think I saw your picture in a Butlers Coffee ad. 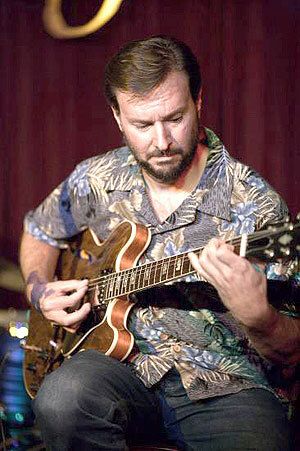 Joey Backenstoe: I occasionally play solo jazz guitar at local clubs, fine restaurants, and even coffee shops for fun. It forces me to keep my chops up. It's challenging to play for 3 hours and keep it interesting. 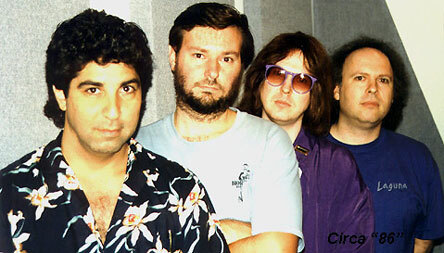 mwe3: In addition to Ted Greene who would you say are your big music and guitar influences? The best guitarists always cite a variety of influences from jazz guitar (Chet, Les, Ted) to modern prog guitar masters like Steve Howe for example. For some reason, Im thinking Les Paul would have loved your approach. Joey Backenstoe: Les was fantastic, and I have always loved Steve Howe. Other major influences would be John McLaughlin, Joe Pass, Pat Metheny, Steve Hackett, Martin Taylor, Al DiMeola, Robert Fripp, Lenny Breau and Johnny Smith. mwe3: What plans do you have for 2015 and are you planning to keep Blue Shift as an active band with the possibility of another album that might happen quicker than in another 17 years? Joey Backenstoe: 17 years? ...that is scary, isn't it? There are no plans at present to do a third CD, but who knows what the future holds? Denise Chandler: ...or what the future orders.